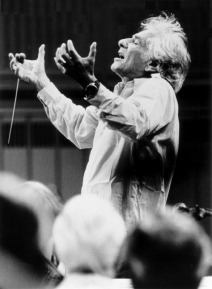 Brilliantly Bernstein: Beyond the Baton | the Mann. American composer Leonard Bernstein, the creative force behind iconic works like West Side Story and On the Town, would have celebrated his 100th birthday in 2018. To mark his centennial birthday, festivities spanning six continents are being mounted from August 25, 2017, Bernstein's 99th birthday, through December 2018. The Mann Center for the Performing Arts was thrilled to join in this international celebration with its fifth community festival, Brilliantly Bernstein. Beyond Bernstein's stellar career as a composer and conductor, this 20th century musical Renaissance man was a great educator, activist, and humanitarian. The Mann's six-month festival explored this legacy through a series of arts initiatives, signature performances, and educational projects. In the spirit of Bernstein, the Mann presented a two-phase residency for young creatives, led by inspiring teaching artists, to compose new works that explore the nation's history and its ongoing struggle to become a more perfect union. These works employed elements of the libretto from Bernstein's musical 1600 Pennsylvania Avenue as a foundation and inspiration. Phase 1 ran from February through May 2018 at KIPP DuBois Collegiate Academy and was led by Darin Atwater, the Mann's commissioned composer for Bernstein: Broadway & Beyond. Darin and select KIPP faculty worked in tandem: (1) to guide scholar-artists in studying the content and structure of the 1600 Pennsylvania Avenue libretto, and (2) to explore principles of song composition and instrumental arranging as tools that give poetic voice and expression to their thoughts about social justice, informed by their personal experiences. Building upon these same objectives, Phase 2 of this project ran for eight weeks during the fall term of 2018. In this phase, the Art of Songwriting residency expanded to include scholar-artists at KIPP DuBois Collegiate Academy and String Theory Charter School, led by teaching-artists Greg Corbin and Jawanza Kobie. At the conclusion of this second project phase, young creatives spent two weeks in a music studio to record their compositions. You can find these works on the Mann's social media platforms. This program was made possible by the support of the Hamilton Family Charitable Trust. In partnership with The Upper Darby Performing Arts Center and performed by students of Upper Darby High School, the Mann Center presented the musical West Side Story to kick off its Young People's Concert Series. Although this Bernstein classic premiered on Broadway over 60 years ago, its themes of hope and love, as well as racial and ethnic social injustice, still resonate with today's youth. This event was presented free of charge and was recommended for students grades 7-12. While Bernstein's West Side Story was inspired by the timeless Shakespearean work Romeo and Juliet, it broke new artistic ground with Bernstein's decision to explore a rivalry between two teenage street gangs of different ethnic backgrounds - one Puerto Rican, the other White - in his musical. Premiered on Broadway in 1957, Bernstein challenged us to wrestle with issues of community integration. He also shined a spotlight on the social conditions that often distinguish one neighborhood from another. 60 years later, the West Side / South Side exhibition was a celebration of diversity in America, drawing public attention to both its successes and challenges. Featuring images produced by student photographers from University of the Arts in Philadelphia, PA; American University and the University of the District of Columbia in Washington, D.C.; and the Art Institute of Atlanta and Clark-Atlanta University in Atlanta, GA, this collection—presented in partnership with Fulton County Arts and Culture and NEWorks Productions—is featured online as a digital exhibition and was mounted in gallery spaces in each city between May and September of 2018. View the online gallery here. The Mann celebrated the 100th birthday of Leonard Bernstein with this signature festival concert. Featuring Bernstein's most treasured works, the program included excerpts from On the Town, Peter Pan, Candide, and the jazz-infused Rhapsody in Blue by George Gershwin, a seminal composer in his own right who was a significant influence for Bernstein. The Mann also presented the world premiere of the newly commissioned work South Side, Symphonic Dances by acclaimed American composer Darin Atwater. An artistic force in the broadest and most creative sense of the word, Atwater's career has encompassed the roles of composer, conductor, pianist, record producer, film composer, entrepreneur, educator, and arts advocate. As Founder and Artistic Director of Soulful Symphony, Atwater has blended American music into many dazzling fusions, traversing genres and literally reinventing the symphony orchestra in America. South Side, Symphonic Dances is based on the eternal tale in Shakespeare's Romeo and Juliet and Bernstein's romantic musical update West Side Story. South Side, Symphonic Dances represents the tragedy and triumph of African-American youth who navigate the complexity of urban living. The war between rival teenage gangs in Bernstein's West Side Story is replaced with the metaphoric rival "gang" of oppressive forces and structures of subordination, including racism, economic/educational disparities, injustice, media bias, etc. South Side, Symphonic Dances attempts to storyboard society's collective struggles and the power of story, music, and culture, transcending boundaries of geography, class, and race - all of the universal concepts that are present in all cultures. From spirituals to hip-hop/rap, Atwater's piece made a connection between coded musical communication and resistance. African-American music is a form of political, economic, and ideological empowerment. South Side, Symphonic Dances advanced this tradition by transmitting sonic perspectives on important social issues - a model of freedom through sounds, words and movements in the body coded by the black community, all speaking to the "figurative nature in black culture" (Henry Louis Gates). "With Bernstein as a springboard, South Side, Symphonic Dances is an attempt to extend his themes of 20th-century integration and multiculturalism," Atwater says. "I hope to create an exciting score wrapped around contemporary social and racial tensions. When you commit to such heroic ambitions, you create inspirational works, transform communities and ultimately bring people together." Inspired by Bernstein’s MASS, the Mann drew together a collective of Philadelphia-based composers, musicians and directors from Philadelphia’s rich African American church community to create a community Mass that explored the relevance of faith in our times. Featuring the Bernstein-inspired compositions of Dr. Rollo Dilworth, Ruth Naomi Floyd, Jay Fluellen and Evelyn Simpson Curenton, the Philadelphia Community Mass was presented as a full concert at the Monumental Baptist Church. The concert was anchored by the Philadelphia Community Mass Choir, a collective of singers representing diverse communities in and around Philadelphia. The performance was punctuated by spoken libretto excerpts from Bernstein’s MASS delivered by leaders from Philadelphia’s civic and religious communities. The Philadelphia Community Mass was presented in partnership with NEWorks Productions and Monumental Baptist Church. The Philadelphia Community Mass was conceived and artistically directed by Nolan Williams, Jr., CEO of NEWorks Productions. This project was supported in part by an award from the National Endowment for the Arts. To find out more about how the National Endowment for the Arts grants impact individuals and communities, visit www.arts.gov. Our festival program would not have been possible without the support of our Education & Community Engagement sponsors. Partners throughout The Art of Songwriting project include: Nolan Williams, Jr., Festival Artistic Director and CEO of NEWorks Productions, Festival Collaborative Partner, Darin Atwater, Composer, Greg Corbin, Teaching Artist, Jawanza Kobie, Teaching Artist, KIPP DuBois Collegiate Academy, String Theory Charter School. Connecting Arts-N-Schools was presented in partnership with klezmer specialist Dan Blacksberg, as well as composer and Kimmel Center Jazz Resident, Jawanza Kobie. The Philadelphia Community Mass was curated by NEWorks Productions and presented in partnership with Monumental Baptist Church. The West Side / South Side photo exhibition was curated by NEWorks Productions and co-presented by the Mann, NEWorks Productions, and Fulton County Arts and Culture.